– Jesus loves me, but I still make him wear a condom. – Have You Threatened Your Children With Eternal Damnation Today? – If you burn a Koran, light it with a Bible. There are hundreds of these quips that are designed to push back against the christian right and to defend ourselves against all the ridiculous ways they are attempting to interfere in our lives and with our laws. In the process of forcing their religious beliefs on all of us, they may ultimately corrupt our U.S. Constitution and demolish the wall of separation between church and state. Of course, this is all under way right now. There is an ongoing discussion/debate amongst my atheist and humanist friends. There are some humanists who hold that we shouldn’t spend our time insulting the ultra-religious or tearing down religion, because we’ll never win them over anyway and we’ll come off as arrogant and strident. We should focus, instead, on educating the non-fundamental religionists. Maybe, if we speak reason to the reasonable, perhaps they will give up their superstitious religious beliefs. On the other side, my more strident atheist friends think we should loudly challenge all this religious hogwash, pointing out every ludicrous aspect of their dogma. I can argue with my friends over these issues, but I don’t do well in debates with fundamentalists. I get so angry with them and their lack of reason and rationality. It’s not that I expect to win-over a religious fundy. It’s that these confrontations are a complete exercise in futility. 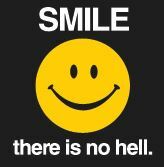 So, for me, for now, I want to experiment by wearing a T-shirt around that says, “Smile. . .there is no hell.” I want to see if it will spark a conversation with someone who might relate to the quip. Maybe this will get them thinking about some other things that they don’t believe either. Maybe I’ll give them a brochure from my Humanist group before we part. HA! This entry was posted in Dogma, Religious Beliefs, The Happy Humanist, Uncategorized and tagged Atheists, belief, humor, religion, secular humanism by steelmanthehumanist.com. Bookmark the permalink. I am still in the strident camp,and would wear a shirt with insults on it,even knowing it is an exercise in futility. My problem is no doubt the fact that I spent so many years immersed in dogma,that my atheism is dogmatic too. As I’ve said a million times, I don’t care what people need to believe to get them through, as long as it doesn’t cost me money,or make policy for me. And their idiotic beliefs are doing both. I like the statement,there is no hell,but I am not a big fan of the happy face.